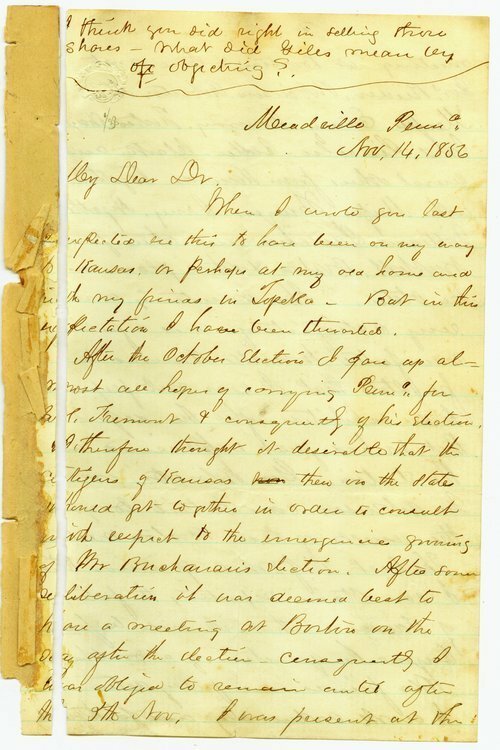 The letter, written by Cyrus Holliday from Meadville, Pennsylvania, discusses the results of the 1856 Presidential election and its anticipated impact on the Kansas issue. Holliday describes to Franklin Crane, a prominent Topeka doctor, a meeting in Boston where he was encouraged to make Kansas a free state. Many of those present at the meeting were influential figures in emigrant aid companies. The letter also discusses efforts to make Nicaragua a slave state in order to achieve a compromise with the South. In addition, Holliday mentions making speeches on behalf of John C. Fremont and Kansas.